But the Neurosky chip was still a black box. No one knew how it worked. The ‘concentration’ number had no relation to anything, except how hard you were apparently concentrating. In an effort to break this black box and build upon years worth of EEG hacks, [Curt White] is hacking a fitness tracker for EEG analysis for his entry into the Hackaday Prize. The hardware in question for this build is a B20 Fitness Tracker, an ungodly cheap piece of hardware that contains an ADS1292 bioimpedance sensor that can be used for ECG, EMG, and EEG. There’s also an nRF microcontroller with Bluetooth that’s easily programmed with an Arduino. All the building blocks are there. Right now, [Curt] has successfully opened up one of these fitness trackers and has done enough of a teardown to get the data off of the bioimpedence sensor. The trick now is to emulate the ‘concentration’ and ‘relaxation’ values the Neurosky chip puts out. This is fairly difficult, as what these values actually mean in terms of brainwaves is a bit opaque, but [Curt] has some filters and some tools to pull data from the brain and output something. Now it’s just a question of outputting the right values. It’s a fantastic hack, that is sure to be a lot more affordable than buying some old Star Wars toys or paying a licensing fee to Neurosky. This is commodity hardware hacked to do something it was never intended to do, and an excellent entry to this year’s Hackaday Prize. The build is centered around the Neurosky Mindwave headset. This is an off-the-shelf product designed specifically for capturing EEG data. It outputs raw brainwave data which is key for doing proper analysis. The project then uses an Arduino Mega to tie everything together, along with some Sparkfun Bluetooth modules to talk to a cell phone to send an SMS for help in the event of a seizure. The real difficulty in a project like this comes from developing an algorithm that can reliably detect seizures, as well as a unit robust enough to work in the real world. It’s no use if your headset is detecting a seizure in progress, but the help message is never sent because a wire fell out of your breadboard. It’s considerations like this, combined with the threat of litigation, behind why medical devices are so rigorously engineered and certified. For a proof of concept, however, such concerns are not as important. We’ve seen Mindwave builds before – brainwave research is an exciting field! 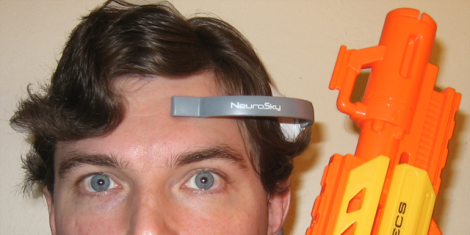 [Tinkernut] started by cracking open the headset, where he found the EEG chip made by a company called NeuroSky (talk about a frightening sounding company name). The PCB designer was kind enough to label the Tx/Rx pins on the board, so hooking it up to an Arduino was a snap. After scavenging an IR LED and receiver from an old VCR, the hardware was just about done. After a bit of coding, you can now control your TV by using the force! (Ok, by ‘force’ I mean brainwaves.) Video after the break. Note: [Tinkernut’s] blog page should have more information available soon. In the meantime if you can find his Arduino Brain Library on github. This isn’t the first EEG to TV interface we’ve featured. Way back in 2010 we featured a project that used an Emotiv EPOC EEG headset to turn on and off a TV. But at $400 for the headset, it was a little too expensive for the average Jedi. We’ve seen a few cool hacks for mainstream commercial EEG headsets, but these are all a tad spendy for leisurely play or experimentation. The illumino project by [io] however, has a relatively short and affordable list of materials for creating your own EEG sensor. It’s even built into a beanie that maps your mental status to a colorful LED pompom! Now that winter is around the corner, this project is perfect for those of us who want to try on the mad scientist’s hat and look awesome while we’re wearing it. How does all the neuro-magic happen? At the heart of [io’s] EEG project is a retired Thinkgear ASIC PC board by Neurosky. It comes loaded with fancy algorithms which amplify and process the different types of noise coming from the surface of our brain. A few small electrodes made from sheets of copper and placed in contact with the forehead are responsible for picking up this noise. The bridge between the electrodes and the Thinkgear is an arduino running the illumino project code. For [io’s] tutorial, a Tinylilly Arduino is used to mesh with the wearable medium, since all of these parts are concealed in the folded brim of the beanie. In addition, a neat processing sketch is included which illustrates the alpha, beta, gamma, and other wave types associated with brain activity as a morphing ball of changing size and color. This offers a nice visual sense of what the Neurosky is actually reading. If all of your hats lack pompoms and you can’t find one out in the ether that comes equipped, fear not… there is even a side tutorial on how to make a proper puff-ball from yarn. Sporting glowing headwear might be a little ostentatious for some of us, but the circuit in this project by itself is a neat point of departure for those who want to poke around at the EEG technology. Details and code can be found on the illumino Instructable. Thanks Zack, for showing us this neat tutorial! Because switching apps to change a song is such a taxing ordeal, [Oscar Celma] and [Ching-Wei Chen] decided to use their collective brainpower to change Last.FM playlists with their minds. They call their project Buddhafy, and it works by taking off-the-shelf EEG hardware and tying it into music streaming APIs. For the build, the guys used a NeuroSky MindWave to read alpha waves inside [Oscar]’s head. The data from the MindWave was passed into a Python script that sends requests to the Last.FM and Spotify APIs. High alpha waves in brain wave patterns correspond with concentration or a deep meditative state. If [Oscar] concentrates very hard, he’ll be rewarded with calm and relaxing tunes. If [Oscar] loses focus, the music changes to the best song ever written. The guys put up the slides from the presentation they gave at MusicHackDay in San Fransisco this last week. There’s also a video of their build in action; you can check that out after the break. [Chris] thinks that using your brain to control your trigger finger is a passé way of operating a toy firearm. Instead, he’s using his mind to fire foam bullets at whatever he thinks needs to pretend-die. To read his will, he’s chosen the Neurosky MindWave, a device that we just looked at for servo control. That hack shows how to patch into the USB dongle that comes with the device, but [Chris] opted to use a BlueSMiRF module from Sparkfun to connect the headset to an Arduino via Bluetooth. The rest of the hack involves modifying the gun for automatic firing. It’s a Nerf Stampede, which takes six D-cells to power the electrical firing system. [Chris] didn’t want to carry that weight around in the body of the weapon itself so he installed a port for external power and added a firing mechanism at the same time. It uses relays to complete the circuit normally operated by the trigger. Now logic-level signals have no problem dispensing justice from the brightly-colored device.